The presence of Nexus Galaxy greatly awaited by enthusiast. This is because these products are already running the latest Android, Ice Cream Sandwich. The operating system promises a new experience on Google’s operating system. Range smartphone “owned” Google, Nexus, really interesting be observed. At first, Google partnered with HTC as their maker’s first smartphone, Google Nexus. Later, along with the launch of Android 2.3 version, Google chose Samsung as the next Nexus producing and called Nexus S. After a time, Google back in cooperation with Samsung and Galaxy Nexus was born. Evolution occurs from Nexus S to the Galaxy Nexus not too much. The most visible is overall physical size enlargement. While from design, they look almost the same. Still with a unique design namely curved body, in ergonomics terms Galaxy Nexus includes good with a thickened design on bottom. You will only find Power/Sleep and Volume on left and right smartphone. 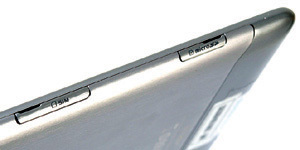 Front is dominated by screen size 4.7 inches (exactly 4.67 inches), with no buttons at all. If you remember, usually at below the screen there is a capacitive touch buttons like home, back, and others. But in Galaxy Nexus, nothing at all. All navigation buttons are already part of system and only in the “inside” screen. We’ll explain more in system operation review section. Still about its screen, the screen has a resolution of 1280×720 or HD resolutions. This screen HD Super AMOLED type which is technically similar as that used in Galaxy Note. 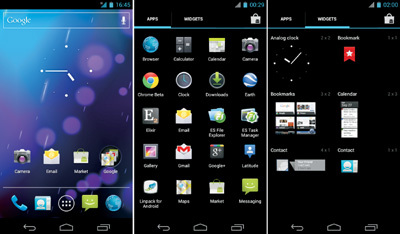 However screen Galaxy Nexus has a higher density than Galaxy Note so that it looks sharper. Unfortunately, this screen is not protected by famous Gorilla Glass. The front of Galaxy Nexus uses only composite material glass that is strong enough, though not as strong as Gorilla Glass. As a main component, Galaxy Nexus rely SoC from Texas Instruments, OMAP 4460. TI OMAP 4460 has two cores running at 1.2 GHz and equipped with a GPU PowerVR SGX540. Quite unfortunately that this is not the best combination. Indeed, good performance and its CPU equivalent to SoC such as Exynos or Apple A5. But was considered old GPU especially considering about Nexus Galaxy screen resolution include high. Capacity of main memory (RAM) owned smartphones is set at 1 GB. Also available storage capacity 12 GB (16 GB variant) for users. The bad news, Galaxy Nexus does not provide a microSD slot so you should be satisfied with existing capacity. When plugged into PC, storage is accessed via MTP mode (Media Transfer Protocol) instead of Mass Storage. From the information we get, Android 4.0 actually supports Mass Storage but is not available in the Galaxy Nexus. 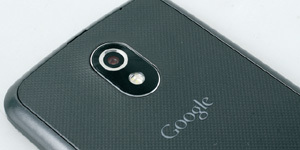 Galaxy Nexus is equipped with a 5 megapixel (rear) and a 1.3 Megapixel (front). Including good quality camera. Only, compared to other Samsung smartphones, the Galaxy Nexus camera is still lacking. Fairly standard camera application. This smartphone considering using OS that still innocent. Interestingly, there are panorama mode where shot using a sweep method which more easier. While for the video, Galaxy Nexus able to record 1080p video with low bitrate for Full-HD size (9.5 Mbps) video. This produces a 70 MB file per one minute recording. Its audio only one channel aka mono. Interestingly, there is a wide range filter effects to manipulate video results. However, because its effect done in realtime, video resolution just dropped to 480p because limited processor capabilities. The advantage big screen-owned Galaxy Nexus feels when watching a video. In addition, it has a 16:9 aspect ratio wide-screen video to make a variety of full-featured with no residual (black bar) at the top and bottom video. Only, this smartphone does not support file with mkv extension so you have to first convert into mp4 format. Full-HD video high-bitrate can be rotated smoothly. Android includes an operating system with a fairly rapid growth. Since Honeycomb launched, Android strengthen its position, especially for mobile computing segments. But if Honeycomb just limited to tablet computers, Ice Cream Sandwich (ICS) comes as a more universal operating system. This is because these operating systems can run either on your computer in tablet and smartphone. And with the release of 4.0 version of this OS, the smartphone manufacturer also brings in droves new devices plus updates. So what makes ICS different from previous versions? The most change and the most visible is the interface. ICS display more or less inherited from Honeycomb. With this change, Model controls also changed. Now you will only be given “button” Back, Home, and Recent App that displays the last row of running applications. As we said earlier, the touch buttons are usually located in body device (smartphone) be eliminated because this button became part of systems. Thus, the display screen with high resolution 1280 pixels actually available lack from that because it already reduced by control buttons place. The main view of Android 4.0 Ice Cream Sandwich. Overall menu structure also changed. Now, widgets are placed inside along with all applications. So if you remove the menu on the home screen (press and hold a blank area on the screen), there is no longer an option “Add Widgets” in there like the Gingerbread 2.3. Changes also occur in Settings menu. This menu settings are now grouped by category. If you set off from Gingerbread, it will initially confused because there are some parts of settings which moved. But when you’re used to, this ICS Settings menu will feel more intuitive. 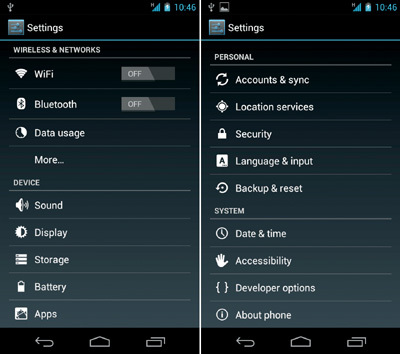 In Settings > Security menu, you will find something new on the Screen Lock. ICS provides a new method to unlock smartphone that is the face recognition method called the face unlock. So you no longer need to sliding ring unlock. Instead, the system will activate the front camera to recognize your face. If it fails, the backup method is to enter a PIN or a pattern (pattern unlock). 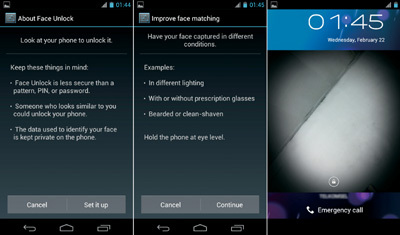 Face Unlock, a new security method offered by ICS. In terms of applications, ICS brings an update on a number of standard Android applications such as browsers, e-mail client, as well as Gmail. 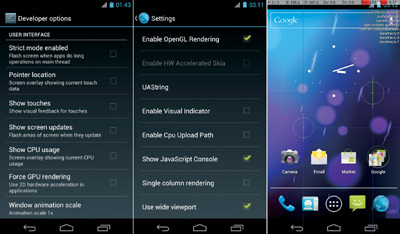 Existing browsers on ICS is a new version offered by Android complete with the latest WebKit engine. Changes that occur from the default browser Gingerbread with ICS browser is felt not only in terms of interface and performance but also the experience gained by users. It is also offered by e-mail client and its Gmail application. So far, the best Gmail application according to us found on ICS. For photography enthusiasts, good news comes via the Gallery application. Now you can directly edit an image from Gallery. The settings are even provided complete enough to create a variety filter effects. Debugging facilities are provided for developers. All existing improvements and updates to ICS was not complete without changes that happened behind the scenes. Starting from this 4.0 version, Google designed in order all related to graphical performed by GPU (GPU Accelerated). This is one reason why the graphical effects like transitions menu, shift items and also rendering a website on browser running so smoothly. The bad news, not all applications support this protocol, especially older applications. When we try to force it all done by GPU to turn on “Force GPU Rendering” option, there are some applications that crashes when executed. In addition to the option, at Developer Options provided in Settings menu you can also choose other options such as “Show CPU Usage”. This option will display the process of what are being processing by processor. All these options are useful for developers for debugging purposes. Of course no ivory that isn’t cracked. During our testing, we found some bugs, such as animated menu transitions sometimes “stuck” in between each other. It takes a few seconds to return to normal. We also often experience an application crashes, including when to use its browser to run flash-based content. When we try with another browser, strangely with same content, no problem. Overall, the Ice Cream Sandwich offers a new and different experiences with previous OS versions. Switching from Gingerbread to ICS is a big change. We liked the variety of his new features while for existing features, repairs and improvement we think quite significantly occurred in the ICS. 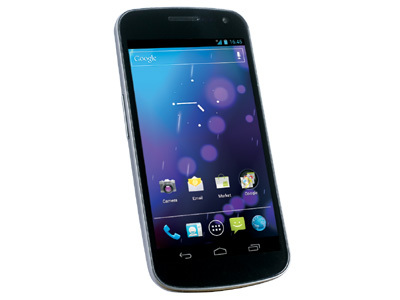 With all its advantages and disadvantages, Galaxy Nexus is an exciting smartphone. Besides being a pioneering smartphone Android 4.0, Galaxy Nexus is also the only Android smartphone the “original” Google formulated. Using the same SoC architecture, Galaxy Nexus won over Prada Phone for extra speed 200 Mhz which is owned by OMAP 4460. But the test of SGX 540 graphics look pretty overwhelmed when screen resolution increases. Its performance was down significantly. Image results and video from a 5 megapixel camera is pretty good. There are only a SIM slot behind the battery cover and no microSD slot. The unique design Galaxy Nexus is contoured slightly curved. Plus: good performance, the Android 4.0 system, good screen quality. Minus: The camera quality could be better, with no external memory facility.